Priced at £4.99 for the paperback edition and just £1.99 for Kindle edition, The Independent Guide to New York City 2016 is the ideal guide book for travellers on a budget. Written by a ‘New York City insider’, this 188 page guide has all you need to know about the city that never sleeps, from popular attractions and seasonal events to dining options and accommodation. 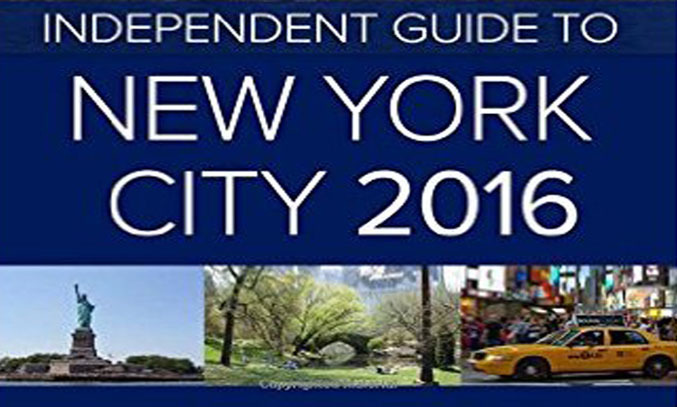 What makes The Independent Guide to New York City 2016 different to other guidebooks on the market (particularly those published by bigger publishing houses) is that the book is updated throughout the year and printed on demand. This means that when you buy the guide, you will receive the latest published version. This is particularly handy if you intend to use the book to find out about a particular attraction or event, such as a Broadway show, which may have changed or closed by the time other print books have been published. • Transportation – Details regarding the subway, bus system, local and express trains, cabs and cycling. • Shopping – A list of department stores, luxury shopping areas and everything in between. The book is well laid out, easy to read and packed full of useful information. In addition to the short description about the venue, it also lists the address, phone number, entry prices, opening hours and nearest subway stops for each listing. The section on NYC customs and etiquette is particularly useful as it explains the ‘unspoken rules’ regarding elevator etiquette and tipping. The chapter on NYC’s transport system is also helpful with a handy section on how to understand subway map. The largest section of the guide is dedicated to the ‘City Guides’ with more than 100 pages in this section. Divided into 21 sub-sections, each of which cover a different neighborhood area, this section boasts a brief description of the neighbourhood including its history and population, as well popular attractions, dining listings (including the best take-out) and accommodation options. The nightlife section is worth checking out, with an impressive 9 theatre shows listings (always a bonus in my book) along with the theatre address, contact details and nearest subway stops. Size-wise, the book’s dimensions of 15.2 x 1.1 x 22.9cm mean it is not as compact as some of the other guidebooks on the market but on the plus side, it is relatively slim and lightweight so should be easy enough to slip into a backpack or suitcase. The fact that it is available as a Kindle edition also makes it extra appealing as you can download the guide onto your iPhone or tablet device to read whilst on the go. I only have two criticisms what are worth a mention. The first is that the custom designed maps at the back of the book are difficult to see and very basic. If you’re planning on exploring the different districts and streets, I would certainly recommend investing in a more detailed map. My second criticism relates to the black and white photos in the paperback version of the guidebook. The publisher claims this is because of print costs, and while I understand that they wish to keep the books as affordable as possible, I still would have preferred the option to order a colour version at a slightly higher price. That said, for the price, The Independent Guide to New York City 2016 is one of the best travel guidebooks I have seen on the market. A worthy contender when searching for your next travel guide. 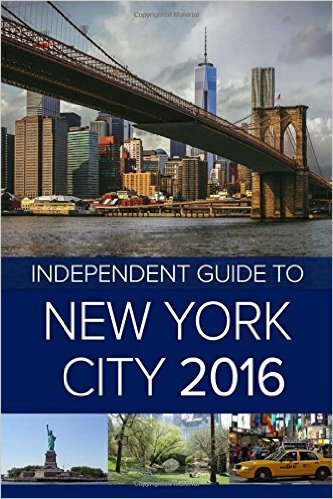 The Independent Guide to New York City 2016 is available to order from Amazon and is priced at £4.99 for the paperback version and £1.99 for the Kindle version.